A useful way for project managers to visualize a project's work breakdown structure is to create a Gantt chart. The Gantt chart is essentially an illustration of the work schedule that a project plans to follow, showing when each element of the project will start and complete. This is a commonly used charting technique in project management because of the basic forecasting that Gantt charts provide. For example, imagine that process engineers at a company have seen an increase in productivity since switching to JMP and using the design of experiments platform for process optimization. Now the company's entire project has been accelerated and optimized, and the project manager in charge of the process can predict from the Gantt chart that the project will be completed a month ahead of schedule, thanks to JMP. By manipulating the bar chart in the Graph Builder platform, you can produce something that looks similar to a Gantt chart if you have the right kind of data. This summer, I spent some time coming up with a more accessible and easy way to produce this kind of chart in JMP. Using Application Builder, I designed an add-in that will produce a Gantt chart once you specify columns from a data table for the following roles: the names of the tasks in the project, the start dates of those tasks, and either the date that the task is scheduled to end or the length of the task in days, weeks, months, or quarters. 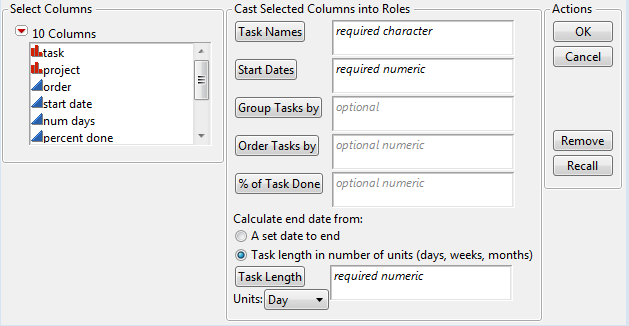 Additional roles that are optional include percent of task completed, a grouping column, and an ordering column (although by default the chart is ordered by the start dates from earliest to latest). Figure 1 below shows the dialog window and the variety of options available for Gantt chart data. Meanwhile, Figure 2 (below) shows an example of what a Gantt chart depicting a fictional software release cycle might look like. 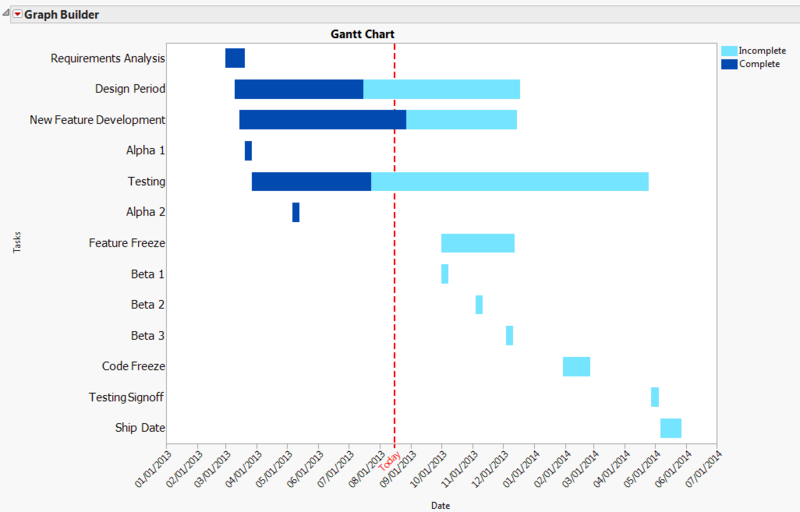 This chart is shown in Graph Builder and was created with the Gantt chart add-in. Why Use JMP to Create a Gantt Chart? There are several other software tools that would allow project managers to produce these types of charts, including Microsoft Project. In that case, why would someone choose to use JMP to make their Gantt chart? The simple answer is that JMP can take the next step beyond looking at a Gantt chart superficially by providing an analysis that could explain why a particular project was delayed or ahead of schedule. This analysis could help make decisions for companies in the future, such as how many resources to allocate to a particular task, or which company to choose for their shipping needs. Add "predecessor"/"ancestor" dependencies so that the chart may shift the dates of ancestors depending on changes to the end date of a predecessor. This capability was partially designed, but could not be fully completed during my time here this summer. I will update the file in the JMP File Exchange as soon as this works. Incorporate critical and non-critical task labeling in order to clearly show the pathway of tasks that are "critical" to the project. Add the ability to visualize the optimal and most conservative time allotment that it would take to complete a project. Add arrows from a predecessor to ancestor task, showing that the two are clearly linked and one must come a specified time before or after the other.